Do you enjoy trying new products? 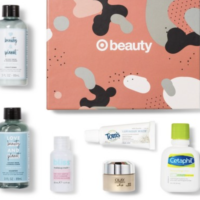 Target is offering up TWO new October beauty boxes for ONLY $5 each + FREE Shipping! These boxes come with 6 products from brands such as Cetaphil, COVERGIRL, Maybelline, Olay, Tom’s, and more! Also, if you are a Target cardholder, you will get an additional 5% off. Note that there is a limit TWO per box. These will go fast, so grab one now if you’re interested!